by Hayes, David K.; Ninemeier, Jack D.; Miller, Allisha A. Prepare future hotel general managers to efficiently supervise and run a midsize full-service hotel. 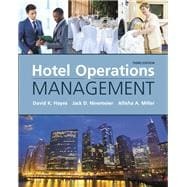 Hotel Operations Management provides an up-to-date and comprehensive examination of all aspects of hotel administration from the viewpoint of the hotel general manager. Detailed information addresses the operating departments of a full-service hotel: Human Resources; Controller; The Front Office; Housekeeping; Food and Beverage; Safety and Property Security; Sales and Marketing; Accounting; and Facility Engineering and Maintenance. In-depth discussions highlight the importance of human resources in the labor-intensive hotel industry, franchising and contract management of properties in an ever-decreasing “Mom and Pop” segment, and hotel management in a global environment. Updated throughout to ensure that readers have the latest information, the Third Edition also includes new case studies, an entirely new chapter on guest services, and new end-of-chapter questions. This accurate book will give prospective hotel managers insight into all of the procedures effective managers use to ensure their hotel¿’s—and their own—success. David K. Hayes, Ph.D. has over 35 years of experience in the field of hospitality management and education. Dr. Hayes initiated the hospitality management program at Texas Tech University. He has held faculty positions at Purdue University and the University of Houston’s Conrad Hilton College of Hotel Administration; as well as the position of Vice President of the Educational Institute of the American Hotel and Lodging Association (AH&LA). In 2005, Dr. Hayes formed Panda Professionals Hospitality Management and Training, (www.pandapros.com); a training resources company that develops customized hospitality education-related computer simulations, print publications, and seminars. Dr. Hayes is a prolific author, having published over a dozen textbooks, including versions translated into Chinese, Portuguese, Croatian and Spanish. In addition to his Ph.D., Dr. Hayes earned the hospitality industry certification of Food Management Professional (FMP) from the National Restaurant Association (NRA) where he has served as a consultant on the ManageFirst program. He also has earned the Certified Food and Beverage Executive (CFBE) and Certified Hospitality Administrator (CHA) designations from the American Hotel and Lodging Association. Dr. Hayes received his Bachelor of Science (BS), and Masters of Science (MS), degrees in Hospitality Management and his Ph.D. degree in Educational Administration from Purdue University, West Lafayette, Indiana. Dr. Jack Ninemeier is a professor emeritus in TheSchool of Hospitality Business at Michigan State University. His Ph.D. is from the University of Wisconsin, Madison. He holds Master of Science and undergraduate degrees from, respectively, Iowa State University and Southern Illinois University. His experience includes more than thirty years of university teaching at Michigan State University and the University of New Orleans, seven years of service as a state-level administrator of a feeding program serving in excess of 350,000 meals daily, and four years of experience in various positions in commercial foodservice operations. Additionally, he was a Research Consultant for the Educational Institute of the American Hotel & Lodging Association for twelve years. Dr. Ninemeier is the author, co-author, editor, or co-editor of seventy-three books relating to various aspects of foodservice and healthcare management, and he has written numerous articles involving these and related areas. Allisha A. Miller is a hospitality industry professional specializing in the development of educational and training materials targeting today’s technology savvy student. As an experienced lodging industry specialist Ms. Miller held the position of Director of Sales and Marketing for the full-service Clarion Hotel and Conference Center prior to joining Panda Professionals Hospitality Management and Training (PANDA) in 2005 as a project manager. 4. Management, Supervision and Service Skills for the G.M.